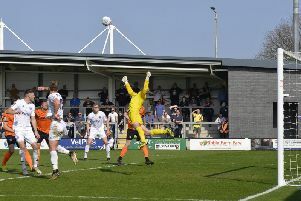 Moving from the Premier League for regular first-team football is a big step for a teenager, but it’s one AFC Fylde winger James Hardy wasn’t afraid to make. The 19-year-old joined from Manchester City in October, despite interest from Football League clubs. He said: “I had a few trials at Championship and League One clubs but quite a few said I wasn’t ready for the first team. They wanted me to play for their under-21s and maybe a year later push for the first team. “I thought I should go to non-league and prove I can play first-team, and hopefully I have done that. After a spell out of the side he has started three of Fylde’s last five games. “It was quite frustrating at the start because the team had won a lot of games, so I knew I had to be patient. I got into the team for a bit but then got injured. The last few weeks have been good and I’m enjoying it a lot more. “I thought I was going to play more but we have some good players here – a few can play at a higher level . The promotion race is entering its final stretch but Hardy is already looking ahead to next season.